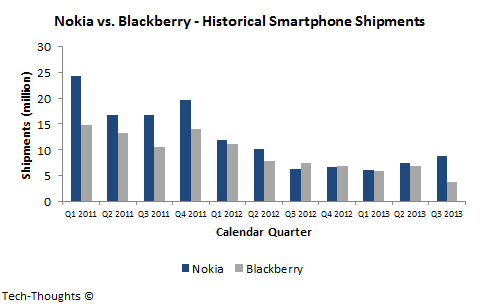 Over the past week, both Blackberry and Nokia were in the news for very different reasons. Blackberry abruptly abandoned their auction process and opted to raise $1 billion in debt to attempt a turnaround. Meanwhile, as the Microsoft deal awaits closing, Nokia announced that Lumia shipments hit an all-time high in the most recent quarter. Let's take a deeper look at the prospects of each company. As I expected, Fairfax was unable to raise the funds required to take Blackberry private. But instead of opting for a break-up sale (probably the best move for shareholders), the company chose to raise $1 billion in debt from Fairfax. Prem Watsa also returned to Blackberry's board and appointed John Chen as the interim CEO. The company does not seem to have a firm turnaround strategy in place just yet, but John Chen's comments suggest that the company may refocus on monetizing enterprise services and messaging. This move would have been ideal if it was implemented 12-18 months ago, when hardware profits were more than sufficient to fund a transition. At this point, the hardware business is likely to continue bleeding cash and shuttering it would cost upwards of $1 billion. The problem is that Blackberry's cost base was designed for much higher cash inflows than what the BBM and mobile device management businesses can realistically pull in, at least over the next 1-2 years. With these factors in mind, I still believe that an eventual break-up sale is the most likely scenario for Blackberry. While this is bad news for investors, their strategy at least reiterated some valuable lessons about declining companies. While Xiaomi and Lenovo focus selling on cheaper devices, they do so profitably. 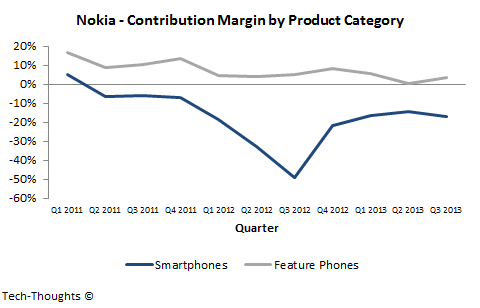 In contrast, Nokia's smartphone contribution margin has remained deeply in the red ever since the Lumia portfolio was launched and actually declined in Q3. 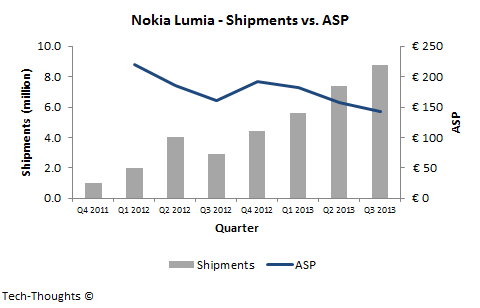 And these figures don't even account for the loss of the Nokia brand yet. It may be time for Microsoft to rework their break-even estimates.